Good Morning Queens and Kings! Let me preface this post by saying that I did this mani on 1/4/2017 and it wasn’t until I was done that I decided to write this post. Therefore, I apologize for the lack of photos from each step. Now that, that is out of the way, I am so freakin’ excited about this post because its taken along time for me to get here. 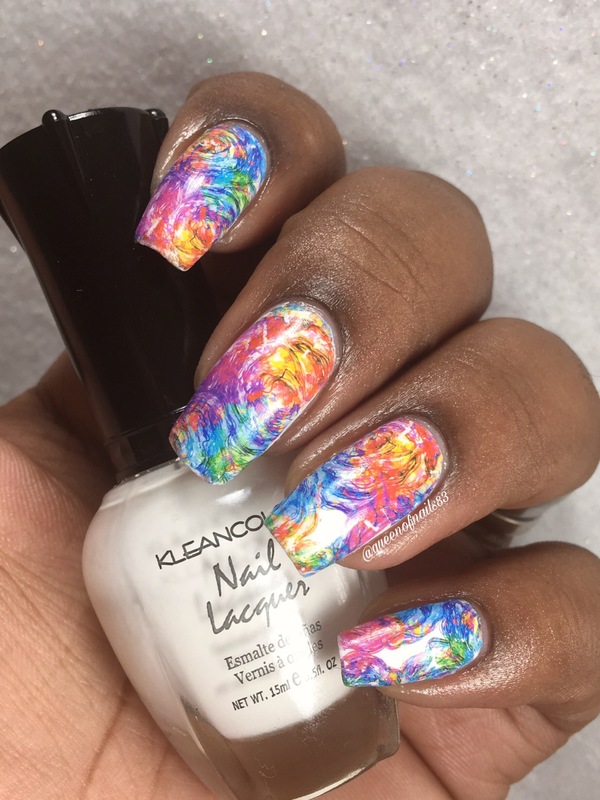 Months ago I had decided to take the plunge and step out of my comfort zone when it came to nail art and try some new techniques outside of stamping, watermarble, dry brush, etc,. I decided I wanted to try water decals. I purchased several different designs and was overwhelmed when I received them because it was something new and I didn’t know where to start. My first attempt ended in pure frustration and me contemplating destashing them. But it’s a new year and a new me…lol so I figured, I’d give them a try one….more…time!! 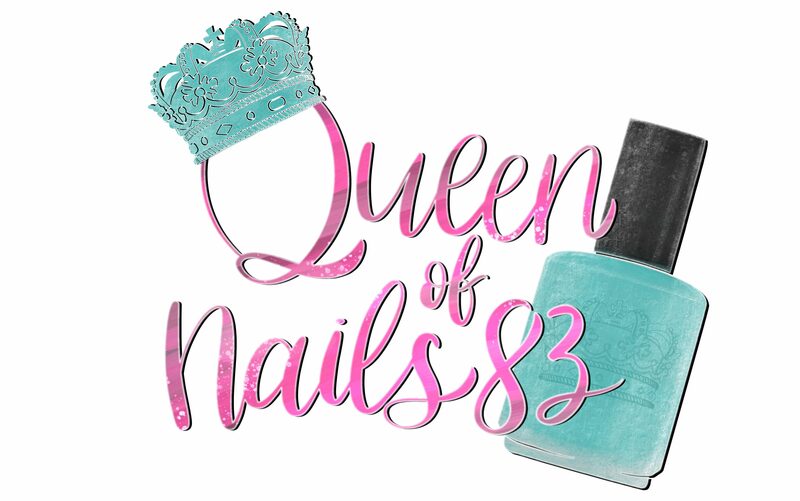 Let’s delve into the awesomeness that is this mani, the result this time were a complete 180. First, I started with 1 coat of my favorite maintenance base, Nail Tek 2 (Strengthener) and applied 2 thin coats of white by Kleancolor. Note – depending on the colors in your decal, you can change to use something more complimentary. Once that was dry, I removed the plastic film from the decal and trimmed them to fit all 5 nails using my nail scissors. Note – I did one hand at a time. Then I place all 5 decals in the cup of room temperature water and waited 20-30 seconds. Note – be sure to use discretion and read the product instructions. When time was up, I removed the first decal using my tweezers, dabbed it on a paper towel to removed excess water and then gently placed it on my nail. Finally, I applied a glossy, quick drying topcoat. The final mani left me speechless. Why? Because I had accomplished what I thought was impossible. Needless to say, I am currently shopping for more water decals. Leave me a comment of brands to try. While I love the designs that BPS offers, I can be very impatient waiting for shipping…lol. Or let me know which, if any, nail art technique makes you a little nervous to try. Milv makes some really gorgeous decals which are finally available from several vendors in US. 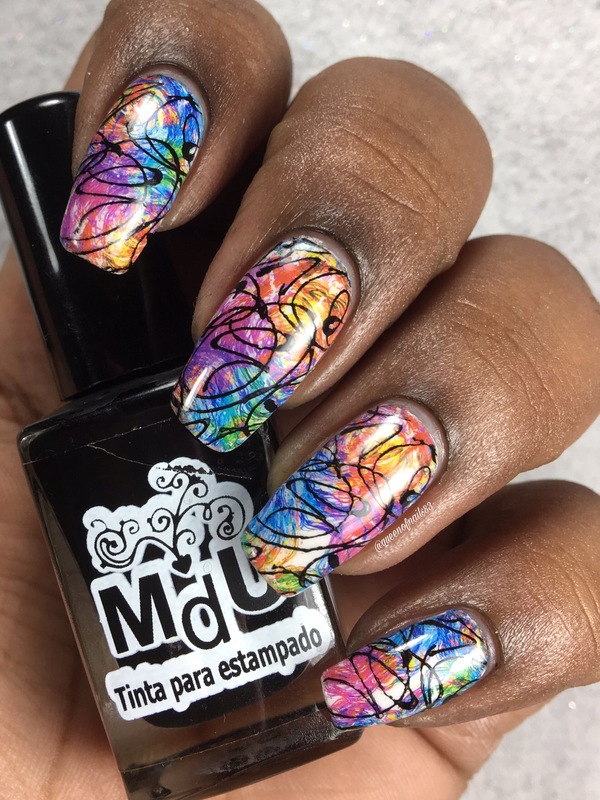 https://store.whatsupnails.com/collections/nail-art-water-decals-silders-milv Is currently having a sale on their own decals. The pattern on those is really cool, and I love the addition of the stamping! I like the addition of the stamping over it! Ohh, these are so cool!! I LOVE the stamping layered over the decal! I love water decals. These are so bright and Spring-y! Congrats on nailing decals! I always struggle with them wrinkling at the sides of my nails. I love your mani, both versions of it!